The ultimate Western bath plays up the use of natural materials, as in this Woodway, Washington, house. Although Ken Brewe calls himself a “shower-and-go kind of guy,” he wanted a more luxurious space that really brought the outdoors in. Placed in a sunlit corner of the master bathroom, the European-inspired soaking tub has a flexible showering arm. A green-glass tile wainscot and an earth-toned tile floor reinforce the rustic, romantic atmosphere. Sources: Piedmont Skirted Bathtub, $3,950 (www.sunrisespecialty.com). Showering arm: Similar from Newport Brass products, from $675 (www.newportbrass.com). Glass tile: Lake Garda in Bay Leaf, from $24.39 per square foot (www.annsacks.com). Floor tile: Sierra Travertine, $6 per square foot (www.metamarble.com). The master bath in John Ward’s Los Angeles home takes a minimalist approach to celebrating nature. The intent, says architect Ron Radziner, was to treat the bathing area as part of the landscape. A large sliding glass door lets in plenty of light while providing a calming view of the private side garden from the cedar Japanese soaking tub. 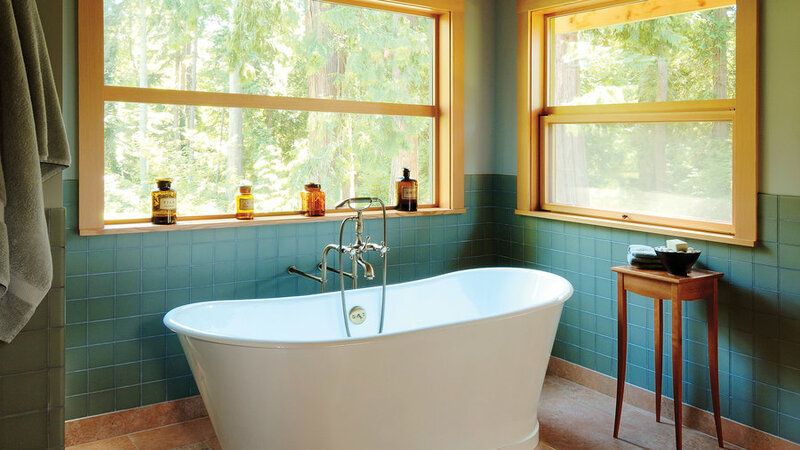 “When you slide open the glass door, the tub becomes part of the outdoors,” Ward says. “It’s very therapeutic.” The simple geometry of the room – the cedar-plank cabinet, the partition between bathing area and vanity, and the floor – derives from the tub, which is a rectangular wood box. Source: Hinoki Soaking Tub, $8,500 (www.oregonhinokiproducts.com or 503/829-4524).